Sam's rescue was a very unpleasant one -- both for Sam and for me. I got the call late in the afternoon at a time when I would have normally put off the rescue until the next morning. There was only an hour and a half of daylight left, and it would take me about 30 minutes to get to the site. But I was told that the cat had been in the tree for 3 nights already and was exhausted and having trouble hanging on to the tiny branches on which it was resting. I decided I should at least give it a try, so I quickly drove out to the site. The cat was only 20 feet high in a pine tree which was at the edge of a parking lot for an apartment complex. The situation did not look as urgent as I was led to believe. The cat was on a substantial branch and looked no more tired and uncomfortable than every other cat I have rescued. No one knew if the cat belonged to anyone or not, and I had no information on which to base any expectations about how he would respond to me. He was resting quietly and comfortably near the end of his branch despite all the activity of the several people who had gathered in the parking lot below him. 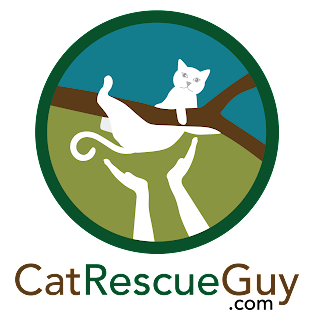 I decided to give the rescue a try, hoping that the cat would be friendly and the rescue would go quickly. It is difficult to understand how my mind works. Since it was getting dark, I decided not to even bother bringing my helmet-mounted camera with me. Yet, somehow, it did not occur to me to bring my headlamp. What is wrong with me? Regardless, I have no video or even still pictures of anything related to this rescue. That is why I am using only a generic silhouette of a cat in place of Sam's picture. Since the cat was near the end of the branch about 16 feet from the trunk, I set my line very high above him so that I would be able to walk out on his limb to get closer to him. Before I began the ascent, I asked all the people below to be quiet and keep their movement to a minimum in order to keep the cat calm. They all honored my request for about two minutes, and soon the loud, raucous talk and constant movement was underway again. In spite of that, as I climbed up, the cat gave me a meow that sounded like it could be possibly friendly. When I stood on his branch, however, the tone of his cries was more distressed, and he walked farther out to the end. From my position at the trunk of the tree, I reached out as far as I could to offer him some food, but he showed no interest. I wish I had had the ability at that time to place the food closer to him and farther away from me so that he would feel more safe to at least investigate it. If I could get him to nibble the food from that distance, I could then begin gradually luring him closer to me and, possibly, into the carrier to finish his meal. I don't know if that would have worked or not, but I intend to try that the next time I have this kind of situation. Since he was showing no interest in the food, and since I did not have time to give him more time to warm up to me, I felt the only option at that point was to try to snare him with the rescue pole. I pulled the pole up to me and walked about eight feet out on the limb to get closer to him. I had to extend the pole to about 9-10 feet to reach him, and I had to do so from an uncomfortable position. There were very many twigs and limbs that interfered with the noose as I tried to position it around him. I struggled very hard from my very uncomfortable position to get the noose around him, but it was extremely difficult. It was very quickly so dark by this time that I could not see where the noose was. Someone below got a flashlight to help me, but that was successful only in lighting the bottom side of the cat, not the top. It was helpful, but I needed more light. The crowd below tried to help me by yelling at me when to pull the noose tight, but they did not understand that I had no intention of tightening the noose around his neck. I had just about decided to put this off till the morning when I tried one more time and managed to get the noose around him. I was successful, however, only in getting him to move a little closer to me and face me. He was now in a better position for me, so I tried again. Again I had difficulty getting the noose around him, but after several tries, I finally managed to get it around his body. I could not see well enough to know if I had it positioned correctly, so I tightened it only to find that it was around his belly, not his upper chest as I had preferred. I decided to just work with that to see if I could get him into the net that way. I tried to pull him along the branch to me, but he was gripping the branch so tightly that it was very difficult. I tried to lift him above the branch, but again his grip was so tight and his weight at the end of a 10 foot pole from my awkward and painful position was too much for me. I kept working at it and finally managed to get him closer to me, but he was still clinging to the branch. I had to clear him away from the branch, so I tried one more time to lift him and, this time, succeeded. Unfortunately, I was pulling so hard when he let go, that I could not stop him from coming too close to me. When he was in range of my leg, he grabbed it with his claws and tried to bite me. I pulled him away before he could do much damage and dropped him in into the net and released the noose. I now had him secured safely in the net, and I was panting from the struggle. All during this struggle, the crowd below sounded like the crowd at a sporting event, such as a boxing match. It was not clear to me who they were cheering for, but it was clear they were enjoying the match. But when the cat grabbed my leg and tried to bite it, that is when the crowd erupted in great laughter. This was the funniest thing they had ever seen, and this was high entertainment. Yes, what could be funnier than watching a cat that is terrified for its life clawing and biting a struggling, panting man who is trying to rescue it? These were not children; they were adults with a childish sense of humor. This was not a cartoon; this was real life and, to the cat, a matter of life or death. To the cat, I am a predator who has caught him and is about to kill him. That is supremely terrifying! Where is the humor in that? I am getting bit and clawed, and those wounds can sometimes be serious. Where is the humor in that? I don't understand. I have learned that it is unrealistic to expect everyone to have reached the same level of development at any given time. But their reaction angered me at a time when I was too occupied with the cat to express it. By the time I finished, the crowd was gone because the show was over. Back to Sam. When I got down to the ground, while I still had him in the net, I scanned him for a microchip, but, not surprisingly, he did not have one. Since no one knew where he belonged, and I had no other place to take him, I carefully let him go, and he quickly ran away. I wished I could have fed him first, but he would not have been receptive to that. It was best to just let him go back to his routine, and, hopefully, back to his home. I wish I knew his story. I wish I knew that he was doing alright. I will never know what happened to him after this, but at least I know that he is not still stuck in the tree. He is better off now than before. Now, at least, he has a chance.